I get a tingle every time I see Steve McQueen's Highland Green '68 Mustang leaping over the hills of San Francisco, and there's a special place in my heart for the Audi S8 from Ronin, but the Ecto-1 is still my favorite movie car of all time. Yeah, it's Halloween, and it's a good time to reflect on ghosts as a newsman. It's what we in the industry like to call a "news peg." But that's not directly why I'm writing about this. Our good friend Douglas Sonders just put together this amazing shoot of a real studio Ecto-1 for his series dubbed The Unicorn Project. Unlike most of my favorite movie cars, the Ecto-1 never gets into a car crash, never jumps over a building, and it can't fire rockets. In a movie full of supernatural entities, the Ecto-1 is remarkably realistic. It's why I love it. If we accept the Ghostbusters movie canon, the Ecto-1 was a 1959 Cadillac ambulance/hearse picked up for about $4,800 by the mortgaged-to-the-hilt Ray Stantz. An ex-ambulance/hearse for a bunch of ghost hunters? Perfect car casting. As a gearhead it appeals to me immensely. When the vehicle first arrives it's derided as a hunk of junk, in poor shape, and not worth the precious little coin they have left. But Aykroyd's Ray Stantz sees the value. A ghostbuster needs to travel with a lot of gear, not chase down bad guys, and if you can fix it yourself all the better. And fix it he does. 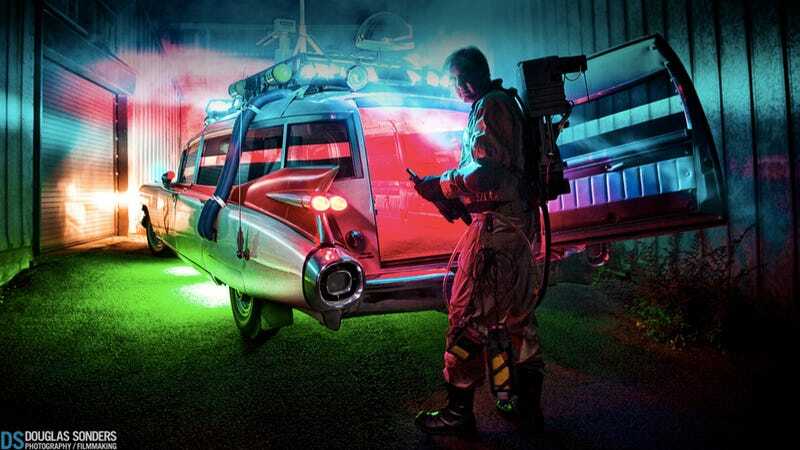 With a lot of elbow grease, some paint, and more lights than a Korean karaoke bar Stantz creates Ecto-1. More than a car, it's the manifestation of the entire Ghostbusters fake-it-till-you-make-it ethos. Think I'm alone? Just check out how many 1959 Cadillacs have been transformed into ghoul-chasing wagons. Click through to see some more photos from the shoot and a behind-the-scenes video.